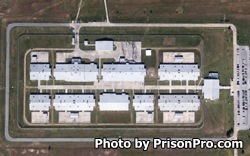 Larry Gist State Jail is a mixed custody facility located on 776 shared acres of land in Beaumont Texas. The facility houses a maximum of 2,276 male offenders levels J1-J5 (minimum to maximum security state jail level), G1 and G2 (minimum security prison level offenders) and transient offenders (inmates who are in transit or held temporarily). Offenders at the Gist State Jail have access to medical, dental, and mental health treatment during their incarceration. Alcohol and substance abuse treatment are provided to all inmates who suffer from addiction. Offenders are encouraged to participate in academic courses that include literacy, adult basic education and GED courses. Vocational training is provided in business computer information systems, and computer aided drafting (CAD). Select offenders at Gist State Jail can provide labor services to local government agencies and organizations that include habitat for humanity, a surrounding area food bank, and the Parks and Wildlife department of Texas. Pre-release services are offered at this institution and include life skills classes, aid in searching for a job, and reentry planning. Religious worship services, biblical studies, and a faith based dormitory is provided through the Chaplains office. Visitation at the Larry Gist State Jail is conducted on Saturdays and Sundays from 8am-5pm. Visits are two hours in duration and depending on the status of the inmate the visit may be contact or non-contact. All visitors must be on the inmate's approved visitation list prior to visiting, contact the facility for more details.